Eastern Turkestan has been drawing attention of researchers of the world for a couple of centuries. Recently interest of the world was drawn to the region due to discovery of mysterious mummies, which are contemporaries of Egyptian mummies and date back as far as 2000 B.C. At the end of the 18th and the beginning of the 19th centuries 11 Russian, 3 English, 2 French, 4 German, 3 Japanese expeditions were sent to the region. These expeditions have found ruins of ancient towns, burial places of the unknown people, architectural ensembles and huge amount of written texts on paper, wooden boards, and walls. They have brought out great amount of materials including written manuscripts, frescos, etc. Now these materials are being kept in museums, libraries and depositories of St.-Petersburg (Russia), Berlin (Germany), London (Great Britain), Paris (France), Peking (China), New Delhi (India) and Japan. The largest collection of the Ancient Uighur manuscripts and fragments - Turfan collection - was collected by the German researchers A.Grunvedel and A. Leqoc in 1902-1914. It includes more than 8 thousand units. Russian collection of the Leningrad Department of Russian Academy of Sciences includes about 4200 units of manuscripts. The materials of both collections are well studies. Some of them were published. Collections of the Uighur manuscripts in other countries are smaller and less studied. Uighur documents found in Eastern Turkestan were written in various kinds of script, namely: Runic, Manichean, Syrian, Nestorian, Estrangelo, Brahmi Tibetan and actually Uighur. Uighur manuscripts found on territory of today’s Mongolia were written in so-called Orkhon script. The majority of the texts, except those written in Orkhon and Uighur scripts, are the religious texts of Manicheans, Nestorians and Buddhists. Orkhon Runic script was used in writing of Epic works. Uighur script was widely used in day-to-day life for economic and juridical needs. I would like to address to this two kinds of script in more detail. Runic Ancient Turkic script came into the world before the 7th century AD. It consisted of 37 or 38 graphemes, which were written separately from each other. The script was created on the basis of Sogdian non-cursive alphabet, which, in turn, ascends to Aramaic. Orkhon script was written from the right to the left. Most of consonant graphemes had several variants of spelling depending on vowels next to them. The system of denoting of vowels is based on the opposition of syllables containing forward and back vowels. Each grapheme denotes a syllable or a phoneme. This script was very suitable for rock inscriptions and inscriptions on wooden boards and sticks. For the first time monuments of Orkhon script were found in the river Yenisei valley (today’s Russia) in the time of Peter the Great at the end of the 17th and the beginning of the 18th centuries. At the end of 19 centuries the Russian and Finnish expeditions were dispatched to Orkhon river (today’s Mongolia) for the search and study of the monuments. Orkhon inscriptions are found on the gravestones, stele and obelisks, which describe the most important moments of life of the buried person. Next to the obelisks are found the stone statues, which personify the main enemies killed by the buried. Mainly, Uighur Orkhon inscriptions were created in the time of Orkhon Uighur Qaghanate, which existed in 745-840. They are the Selenga stone, Qarabalasaghun inscription, Sevrey stone, Terkhin and Tesin inscriptions. In those inscriptions we can find details on the history of the Qaghanate. Some samples of the Orkhon runic in the Uighur language were also found in Eastern Turkestan. But they are insignificant in number. The important fact is that so-called «Ancient Turkic language» actually is divided into 2 languages – the language of Ancient Turkic Runic inscriptions and the language of Ancient Uighur inscriptions. These two languages practically are the same. Creators of the Ancient Uighur manuscripts in Eastern Turkestan in one manuscript write, that they translated certain text from the certain language into Turkic, and in others the same translators write, that they translated the text into the Turkic Uighur language. (Shingko Seli-Tutung – Altun Yaruq – Suvarnaprabhasa). Uighur interpreters, monks and officials knew that the literary and linguistic tradition, which ascended to the Runic obelisks on Orkhon river, was uninterrupted and continuous, irrespective of change of religion and customs, and this tradition was related to the creators of the first written texts who called their language Turkic. Uighur script was created on the basis of Sogdian cursive (italic) alphabet not later than the beginning of the 1st millennium. 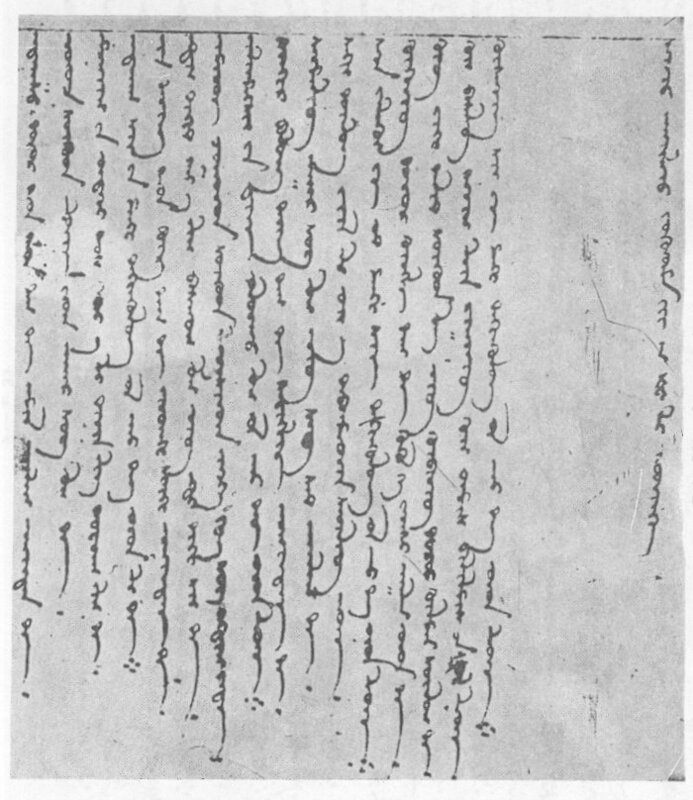 The earliest work written in the Uighur language in Uighur script “Huastuanift” – “Penitential pray of Manicheists” was dated by the Soviet researcher S.E.Malov the 5th century A.D. After having studied the Chinese historical chronicles, Uighur historian Turghun Almas asserts, that Uighur script came into the world several centuries before Christ. The Uighur alphabet consisted of 20 letters, including 5 vowel and 15 consonant graphemes. 3 out of 5 vowels denoted 2 sounds each, thus they reproduces 8 vowel sounds. 3 consonant graphemes denoted 2 sounds each. Thus they reproduced 20 consonant sounds. Thus, the alphabet, which consisted of 20 graphemes, reproduced up to 30 phonemes. The spelling of the graphemes depends on their location in a word, i.e. each letter is spelled differently in the beginning, middle and the end of a word. The text in Uighur script was written vertically, from above downwards. Uighur script, being compact, reflected phonologic system of the language in the conditional form. Therefore today the restoration of real phonation of the language elements is very hard. As it was already said before, the Uighur documents found in Eastern Turkestan, mainly represent the translations of religious texts, and also significant quantity of the economic and legal documents. The religious texts including Buddhist, Manichean and Christian sutras, tenets, descriptions of life of the Saints, etc. were translated from Sanskrit, Tokharian, Chinese, Sogdian and other languages. The main purpose of these documents was the distribution and strengthening of religion in Eastern Turkestan, Mongolia, and also in China. These documents are of particular importance for the researchers because many works in the originals language have not reached us. They would have been irrevocably lost, if there had not existed their translations in the Uighur language. The legal documents included papers attesting sale and purchase, loan of money and property, borrowing of cattle, rent of property, debt receipts, etc. The economic documents comprised the orders and references of authorities concerning economic activity of landlords and farmers. Such documents were written not only by officials, but also by ordinary people. It shows the high level of literacy among the Uighurs in the Middle Ages, as every farmer could write. As is known, the Mongols by the order of Genghis-khan adopted the Uighur script in the 12-13th centuries through Uighur clerks, administrative officials, and also khans’ children educators, who occupied important positions at the court of the Mongolian khans. Plano Karpini, Guillom de Rubruk and Marco Polo wrote about it in their travel notes when they visited the Mongol Empire in the 13th century. In Mongolia this script is still used though it is a little modified variant. 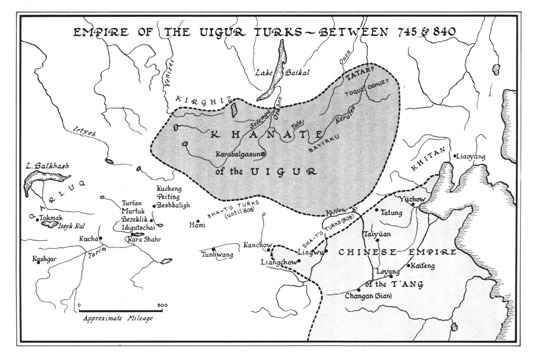 In the time of Mongol dynasty Yuan in China in 1260-1368 where the Uighurs also occupied important administrative positions, the Uighur script was borrowed by the Manchu. By the 7th century A.D. Buddhism lost its ground in India, and in China it did not yet spread vastly. Thus in the 7-10th centuries Eastern Turkestan became the world Buddhist center with hundreds of Buddhist monasteries and thousand of monks. Buddhist monks and those who wanted to follow Buddhism came into Eastern Turkestan from all Central Asia and China to purchase religious books, to receive enlightenment, and to participate in theological discussions. The demand for books increased extremely and the old days’ method of book writing and copying, which required large forces, expenses and time, could not satisfy the demand. At this particular time in Turfan the book printing by xylography was invented. Perhaps, it is not the accident that the majority of Uighur manuscripts dated the 8-13th centuries was found around town of Turfan, which was the pioneer of book printing. Some say, that xylography is a Chinese way of book printing. But they are mistaken, relating Turfan to China. Today Turfan is in China, but in the time of the invention Turfan was not a part of China. It could have been very difficult for the Chinese to introduce this way of book printing, since the Chinese language is expressed on a paper by means of thousands of hieroglyphs (characters). It is an infernal work to cut out thousands of tiny hieroglyphs, which could have been destroyed after several printings. After that it would have been necessary to cut them out again. According to T.F.Carter, the Chinese written official chronicles do not indicate that the book printing was invented in China. To compare, it is necessary to say, that in Europe the xylography came into the world only in the 14th century. The first printing press in Europe was invented by Joan Gutenberg in Germany only in 1450. Thousands of books printed in Eastern Turkestan needed to be stored somewhere. For this purpose, numerous libraries were built. Up to this day researchers discover documents, books and manuscripts of the past in those libraries. By the religious context the Uighur documents in Uighur script are divided into 3 categories: the texts of Buddhist, Manichean and Christian contents. A minor part of the Uighur manuscripts discovered in Eastern Turkestan were written on a wooden boards and sticks. But the majority of them was written on a paper. Manufacture of paper in this region began approximately in the beginning of the 2d century AD, first in Hotan and Qashqar, and later in Turfan and Kuchar (the 4th century). Paper was produced of bark of some trees (Broussonetia papyrifera, paper mulberry-tree). In Aqsu area paper was produced of cotton. In the process of producing paper, it was imbued with starch glue, then covered with a layer of plaster and polished. To ensue the best preservation of paper, it was imbued with sap of flowers and fruits of certain tree, which is called thumäk in Uighur (huay). It is interesting that nowadays in Eastern Turkestan local Uighur craftsmen produce paper by the same way, as their ancestors long time ago. Documents found in Dunghuang and dated the 18th century are the last manuscripts in the Uighur language in Uighur script. By the 18th century, mainly the population of Eastern Turkestan had switched to the Arabic alphabet. Only Buddhist clergy, who formed a stronghold in Dunghuang, continued to use the same old Uighur script. Script, which was used more than 700-800 years not only by the Uighurs, but also by other Turkic and non-Turkic peoples, as well as huge cultural and political influence of the Uighurs in Central Asia fell into decay with arrival of Islam into the region. As is known, Uighur khan Sutuq Bughra-khan adopted Islam in 932 and since then the influence of the Arabic language, culture and arts on the peoples who inhabited the region has steadily increased. Though in Turfan and Dunghuang areas Buddhism and its influence remained unchanged up to the 14-15th centuries. Eastern Turkestan has been regarded by many scholars as the most mysterious spot on the planet. However, this region has not been sufficiently studied since the lack of resources and well-known attitude of the Chinese government towards foreign presence in the region erect insurmountable obstacles for researchers. Nowadays, the Uighur people who has created numerous invaluable monuments in literature and arts, who has influenced the development and evolution of other people and played an important role in the politics of the region, is being annihilated by the Chinese government policies. If the world continues to do nothing about it, this people will cease to exist. All materials herein are copyrighted and protected by Law. prohibited and prosecuted by Law.